Houses & Homes VA: Did you know that some video games are actually GOOD for our children? Did you know that some video games are actually GOOD for our children? It seems that some controversies will never end. When I was young this very same question loomed in the mind of my parents and now, a parent myself, I also limit the amount of time that my children are allowed to play video/computer games. I suspect that previous generations had the same concerns regarding television and before that, radio. So is there a definite answer as to how much time a day a child should be allowed to waste time on such frivolous activities? Actually, no, but according to most experts there are some concrete benefits for children that play today’s electronic games. Indeed there are studies that show certain video games can improve a child’s hand to eye coordination, enhance their problem solving skills and even improve the mind’s ability to process information more quickly. This being said, too much time being spent in this way also has negative side effects. Obviously, pushing the button of a controller is not the best physical exercise a young person can get and does nothing to improve his/her social skills when interacting with other children. And what about time away from friends? Social interaction is extremely important if young people are to learn how to get along well with others and no video game is going to teach this basic life skill. Also, some studies have shown that children that play violent video games show more aggression towards others than children that do not. There is also the obvious fact that more important activities simply won’t get done if the child wastes too much time playing their favorite games such as homework, household chores, etc. The bottom line is that even too much of a good thing can be bad. Use your common sense and teach your child to have a proper balance in life. “All things in moderation” is not bad advice and the sooner that your child learns that there is a time and place for certain activities, the better prepared he/she will be for the responsibilities that come with adulthood. For what it’s worth, no more than 2 hours a day seems to be a fairly common limit that parents place on video games although some allow even less time to play. 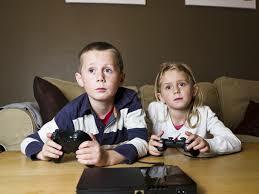 How much time do you allow for your children to play video games each day?